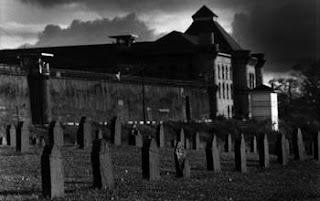 While we are working on getting our evidence together from our visit to the historic Mansfield Reformatory, here's a short video-cast that we made on the way home from the prison. Featuring Eric and Jen Williams, Denise Donaldson, Craig and Mandi Worrell and myself. Keep checking back for more information of our trip! Well, the PERVS are in the van and we're heading towards Mansfield. Stay tuned! I was sitting here in my house at 2am getting ready to go to bed when I heard Sara cry. She began to cry because her tummy isn't feeling good. However, I have noticed that she has been talking at night in her room. She has also been talking after she gets up in her room. As if she is talking to someone. This has gotten me thinking...do little ones see and talk to ghost's? If so when do they stop seeing them? I also started thinking about the time change. If 3am is suppose to be the thinnest hour when spirits can contact us, what happens when the time changes in the fall and spring? What about the time zones? For that matter are ghost's in Indiana confused? What do you all think? I would love to hear your thoughts on this. Episode 2 of the Ohio P.E.R.V.S Pervcast! Behold in all of its glory, episode 2 of The Ohio P.E.R.V.S Pervcast! In this episode, the gang and I talk about what we've learned so far with both technique and tech to make a successful paranormal investigation. Please, let us know what you think of our Pervcast! Brace yourself this Halloween when TAPS takes you on the ultimate ghost hunt. The team returns to the Fort Delaware scene of this season's most jolting and revealing episode. Commonly referred to as the "Black Hole," Fort Delaware was used during the Civil War as a POW camp that housed over 33,000 Confederate soldiers. Ravaged by epidemics and torture nearly 2,400 failed to escape and died on the island. The restless spirits have never left. Join the exclusive seven-hour hunt from home with access to thermal imaging camera feeds and live Q&A with TAPS team members and host Josh Gates. Watch carefully for anything out of the ordinary — you'll be able to send instant alerts of any sightings you make straight to the Ghost Hunters! Well our first podcast is in the tank and I, for one, had a pretty good time putting with the wehole process. Mad props to ANDREW, our IT_Messiah for getting it up and running. What happens when you take a few ghost hunting fools, get them into a room together and record their conversations? You get yourself a PERVcast. Take a listen to our first of hopefully many podcasts...I mean PERVcasts! Now, I know that the audio quality needs to be a little better, so I beg your forgiveness on that, we will improve the quality for the future. Also, original bumper music provided by my son, Alex. I do realize that a few of these will have to wait until kids are in college and at least 2 of us have won the lottery but the last one on the list is near Gettysburg. Looking forward to Ghost Hunters tonight. Our friend Sherri is in the Akron-Beacon Journal Today! If you have the chance to go on a ghost hunt with Sherri, we HIGHLY recommend it. She is someone that explains the history of the location and not just a "ghost story". Plus, she's a great person to learn from. The following article appears in the Wednesday, September 3, 2008 Akron-Beacon Journal. At twilight on a recent summer night, three dozen people formed a half circle around the woman wearing a long cape. She placed a lantern on the ground, illuminating the faces of the curious. Sherri Brake-Recco explained that 21 men died here in 1779. The place is Fort Laurens, in an area now known as Bolivar. Among the burial sites found on the grounds was a mass grave that contained the remains of at least 13 soldiers who were killed by Indians during an ill-fated wood-gathering party. Years ago, their bodies, and others, were exhumed and placed in the walls of the museum on the property in Tuscarawas County. On and on . . .
''Some people say that on the site of massacres, there is an energy that's left behind,'' said Recco, a paranormal investigator who encourages the ghost hunters to explore the site. Recco is the owner and operator of Haunted Heartland Tours, voted among the top 10 best ghost tours in the nation by those who submitted their favorites to New Orleans' Haunted American Tours, an online resource for ghost stories and other creepy things. The friendly 44-year-old Canal Fulton woman is a combination investigator, historian and storyteller. Each year she averages about 120 events, which include presentations and tours offered throughout the year — not just at Halloween. And because preservation of historical sites takes precedence over everything else she does, a portion of her proceeds is donated to the various organizations such as historical societies that have helped make her presentations and tours such a success. During a recent local tour, she explained to the more than three dozen men, women and teenagers on board a luxury bus that she began investigating the paranormal 26 years ago. But because she feared they might think she was evil, she kept it from her family and friends. ''Nothing could be further from the truth,'' she said, the cross, attached to her bracelet, dangling in the light of the setting sun. As a small child, she had an invisible playmate. And when she learned to read, she loved books about UFOs, witch trials, ESP, magic, the paranormal, ghosts and folklore. As a young teen she dabbled in investigating haunted locations, documenting her first paranormal investigation at a house in Stark County in her early 20s. At the Massillon Cemetery, beneath a full moon, she told the group about dowsing rods. Ninety percent of people have the ability to use them, she explained, standing on a path she refers to as mausoleum row. Holding L-shaped rods, made of coat hangars, she offered them to the group. On her Web site, Recco writes that there is nothing evil about the rods. They will not make you lose your hair or your job and there are no hidden powers, she explained. Instead, the user focuses on his own extra sensory perception. And when he focuses and concentrates, it's possible to accomplish great feats. The anxious participants walked with a rod in each hand. Frequently, the rods crossed, presumably indicating that what they were looking for had been found. ''I'm going to make a set of these,'' squealed Malvern's Sherri Troyer. The next stop was Rogues Hollow woods and Cry Baby Bridge in Wayne County's Chippewa Township. Before stepping off the bus, she gave eachsleuth an EMF, or Electromagnetic Field Detector, a modern-day ghost researcher's tracking device. ''No, these are not stud finders,'' Recco chuckled. ''They wouldn't detect a stud on this bus,'' quipped someone from the back. The tour guide explained that the valley earned its name during the 18th century. Men who worked in the coal mines were famous for their barroom brawls and roguish behavior and spread rumors of wild goings-on in the area. Among the undocumented legends is the story of a witch who tossed her newborn baby from a bridge that runs over Silver Creek. Another is the tale of a family crossing the creek in a buggy. One of the children was lost in the raging waters. And, thus, the rumor that on a quiet night, it's possible to hear the voice of a crying child. Everyone listened. The rippling water of Spring Creek, and the noise from a nearby train, were the only sounds. Recco told the group that there were paths leading into the woods that were lit by lanterns, but the deeper they explored, the fewer the lights. Anxious to test their detectors, the amused explorers scurried into the woods and nearer to the waters beneath Cry Baby Bridge. The occasional screams and shrieks made Recco smile. ''Everyone have fun tonight?'' she inquired after her clients boarded the bus. They vowed to return for another adventure. Kim Hone-McMahan can be reached at 330-996-3742 or kmcmahan@thebeaconjournal.com. We got the tickets for the Ghost Hunt at the Reformatory! I'm coming home Ghost's! The Medusa here use to work at the Mansfield Reformatory for a summer as a tour guide. It is fun to learn that I will be going as a ghost investigator and not working in the gift shop all night. Yeah! Watch out Johnny in solitary. The PERVS are on the case! First off, Thank you Jason and Grant from TAPS for being such nice guys and putting up with my nephew this past weekend at Lily Dale in New York. With that done, this is my weekend of TAPS goodness! Have you ever had "something" come home with you? "No I don't believe so. I don't wear symbols or charms or anything. I just don't think I have had something come with me." 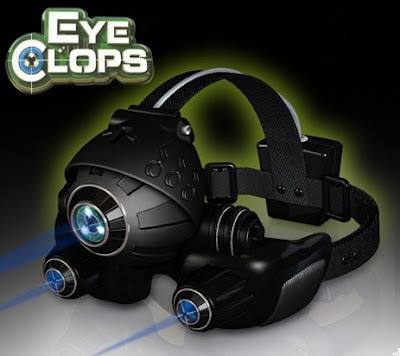 What piece of equipment do you get the most evidence on? "Definitely EVP's. Have you ever used or thinking about using an all light spectrum camera? "No, but we are working on a camera that can see electrical fields which will be a great asset." After the brief Q&A I got to snap this pic of Grant. The next day was their presentation. As they stated from the beginning they are not professional speakers, but they did just fine. They started off with a small disclaimer and stated that they don't hate Psychics, don't charge money for an investigation, and they don't hate psychics. They explained the difference between different hauntings, residual, intelligent, and non-human. So with that said they talked about different cases they have been on and the findings the group have found. Very interesting. As they mentioned, about 80% of the cases they are called on can be explained with simple answers. It is the last 20% you have to scratch your head on. Much of the footage can't be shown because it is private for the home owner. Understandable. Not everyone is understanding and open minded but they wish they could show it. "Where is the scariest place you have every been? Not a place but some of the home owners." They have run across some that have memory problems, mental problems, or were taking illegal taking drugs. "What is your personal experiences? Don't talk about them. We keep them personal." "Do you really work for Roto-Rooter? Yes we do! We also can help you with a plumbing question." They also played some EVP's for the crowd. The biggest thing to remember is not all messages will be pleasant. So be prepared for it. They also played some clips from the show of different places. The first was Eastern State Penitentiary. We all know the famous pic of the figure that chased Brian and made him run away like a girl. However, interesting information came to them after everything was said and done. At Eastern during it's true solitary days they would put black sheets over the heads of the people being brought out to shower. The only thing you could see of them was the bottom half of their legs. If you get a chance to see the footage again that is exactly what you see. Which leads to a questions,"why is a ghost always seen wearing clothing?" Answer, " Don't know but we have never seen one naked." Ohio P.E.R.V.S. members Denise and Andy will be doing a mini-investigation at Gettysburg this coming weekend along with two junior members. Translation: We're taking the kids on a quick trip to Gettysburg Sunday and will do a little ghost-hunting while on site. If we come up with anything cool, it will of course be posted here! Don Keating of Cambridge, a former Newcomerstown resident and the originator of the Eastern Ohio Bigfoot Investigation Center, will be featured on next week’s episode of the History Channel’s “MonsterQuest” miniseries. The episode, to be broadcast next Wednesday at 9 p.m., is titled “Ohio Grassman.” The program will be repeated June 19 at 1 a.m. History Channel is seen on cable Channel 24. The History Channel’s Web site describes the Grassman as “a bogeyman that has terrified local children for over a century.” And, according to stories and sightings, is similar to a Bigfoot, but builds strange nests and has been known to attack. Keating was interviewed for several different parts of the show, as were residents of Noble County, Canton and Sunbury, the latter who claim to have sighted a Bigfoot at Salt Fork State Park near Cambridge in late December 2006. Denise and I attended one of his seminars a few years ago and found it very interesting. I have always had a fondness for the phenomenon know as Bigfoot. Especially since I had my own experience back in 1997 while living outside of Kent. The PERVS might have picked up some interesting pictures from our ghost walk on Saturday, June 7, 2008. These might be possible pictures of evidence but we shall leave that up to the viewer. Please take a look and let us know what you might think. On one part of the tour we stopped at an area near a train line. The story of the area is a man had killed himself by shooting himself in the heart after being rebuked by a woman he was in love with. Here are few pictures taken in that area. In the first picture you see a red mist rising off the grass. Perhaps something...not sure. We do know that a different man in the group also had the red mist in one of his pictures too. This picture was taken immediately after the rising mist not even one second later. As you can see here the red mist seems to be hovering over the ground. This picture below is of the train tracks near where the man had killed himself. This seemed a bit odd. Just like the previous pictures, a picture was taken right after and showed nothing. The picture that really intrigued us after it was taken was the one below. This was taken in a pioneer cemetery. There are founding city members and children buried here. There are also many unmarked graves and possibly unknown graves here. At first we thought we had captured something. We're still not sure. We do know that the camera shutter was open for 2 seconds. A lot of things can happen in that time. However, you can see that the woman on the right side is in focus but the boy on the left is not. We think perhaps he was moving and the camera might have taken multi pictures. This was taken with a digital camera. As for the middle the streak in the middle might be a line of energy or could be a light source. The boy on the left did have a candle in a lantern on the ground but was not moved. The other small light you see in the background might be a different source of energy. The light appears to be coming from the cemetery. You can also see what looks like two outlines of light gray behind the light streak. If you look you will see what appears to be two silhouette. Evidence? Not sure but it is intriguing. The town of Zoar, located in the Tuscarawas Valley, was founded by a group of German Separatists in 1817. The spiritual leader of the group was Joseph Bimeler. When they first settled, life was extremely hard for them, so they formed a communal-type society, in which every citizen contributed, and all food and clothing was shared. There were textile mills, farms, a tin shop, a cooper, iron foundries and several stores. They made money by contracting to dig a seven mile stretch of the canal, which enabled them to pay off their debts early on. Over time, outside influences, such as guests at the hotel, worked to eventually have the communal Zoar disbanded, and citizens were each given a piece of land as their own. Today, the Ohio Historical Society operates a portion of the town as a historic site. A number of the Zoarite buildings are restored and are open to the public. METHODOLOGY:First impressions- group was optimistic, this was our first hunt, first group to enter Tin Shop this evening. Group spent approximately 20 minutes here. Took digital photo, video, audio. Experiences: Jennifer got the impression of a tall, thin, gaunt man, very stern but not mean, with dark hair and beard, and he lived on the second floor. Jen also heard distinctive ‘knock’ coming from upstairs, which is empty. EVP: You will hear a car driving by, shortly thereafter a strange sound which the group describes as a small child vocalizing. No children were in vicinity. METHODOLOGY:First impressions: too much outside noise, not promising, others investigating. Group spent approximately half an hour to forty-five minutes, between upstairs and downstairs. Digital photos, video, audio showed nothing. METHODOLOGY:First impressions: many others investigating, lots of noise. Eric and Andy investigated basement of Number One House. Digital photos and video showed nothing. K2 meter was also used. They had several EVP’s and personal experiences, and modest K2 readings. Andy described having ‘had an eerie feeling’, brushing against something, took photos but nothing appeared. Eric attempted to communicate with an entity and picked up two EVP’s as a result. EVP: Two EVP’s occur in short order. The first sounds like a hard soled boot taking two steps across the stone floor. The second happens about a minute after the first and Eric makes mention of all the noise upstairs sounding like a “herd of water buffalo”. The voice sounds as though it may respond by saying “mm hmm”, as in agreement. METHODOLOGY:First impressions- possible activity on the first floor landing next to clothing exhibit. Eric, Andy, Denise, and Jennifer investigated the first floor landing after being told someone felt they were ‘pushed’. Audio from digital recorder and audio from the video both record an EVP of a woman’s voice after spikes on the K2 meter. METHODOLOGY: Eric and Andy went to the attic and witnessed a woman having a personal experience with a ghost child. Digital photos, audio recorders, and videotape proved inconclusive. The woman having the experience was visibly upset and sad. She claimed to have contact with a sickly little boy who was upset with all the noise and people in the house that night. METHODOLOGY: Andrew and Eric visited this stone basement together. After spending about 20 minutes of investigating, the team turned up one EVP. Digital photos and digital video turned up negative. A K2 meter turned up modest results and K2 activity did coincide with the EVP. No team member had a personal experience. EVP: Eric asks the questions while Andy is taking photos. Eric asked the entity if it was a child and the entity responded with a distinct, though very soft “yes”. Speakers need to be up for this one. METHODOLOGY: Jen and Denise went into the lowest part of this basement. As they were going around the corner down the stairs, Denise saw a dark shadow go around the corner in front of them. Tried to recreate this shadow by going back up and down several times, but were unable to recreate. Immediately upon following shadow down into deepest part of basement, Denise felt very uncomfortable. Audio recorder used, possible EVP of a heavy sigh into microphone. No camera was present at this time. Jen tried EVP work, with humming. When humming would stop, EMF would spike, as if to prod her to keep humming. Denise felt a sudden tug on hair at this time. EMF spikes continued for approximately 10-15 minutes. EVIDENCE: Equipment malfunction, K2 readings very active. METHODOLOGY: Team went back into part of basement where Andy and Eric got the “Yes” EVP, almost full battery went suddenly dead, K2 readings spiking very high, seemingly in answer to questions. No EVP’s caught, but Eric felt that he heard ‘something’ behind him at one point. Questions ‘answered’ seemed to be that it was a younger, married, male entity. FINAL IMPRESSIONS:Overall, too many people involved in hunt to be able to investigate accurately. Too much outside noise, and people moving around. We had many personal experiences, but it was noted nothing happened in the Number One House until Jen picked up a quartz crystal and started carrying it around. At the end of the evening, we spoke to one of the Zoar tour guides and asked if she knew anything about the tin-smith, and she told us she had seen pictures of the gentlemen. Her description of the pictures matched almost exactly to Jen’s earlier impressions of the man who lived there. The guide also told us the man was married and had 7 or 8 children, and did, in fact, live in the upstairs of the tin-shop, as Jen had suggested earlier. We were pleasantly surprised to have been able to capture all of the EVP’s that we did, even with the large crowd that was there that night. Special thanks goes out to our “Ghost Guide” of the evening, Sherri Brake-Recco of Haunted Heartland Tours, and her work with the Ohio Historical Society for arranging this hunt. Canal Fulton is a quaint town with a ghostly past. SLIDESHOW: Tour Warehouse On the northern edge of downtown is an old warehouse on the canal. The three-story brick building dates back to 1906. It used to be a mortuary and funeral home. Now the building is home to an antique store, Let's Mango Tea Garden restaurant and a host of spirits. The most prominent ghost is Lester. He once ran the mortuary and still likes to hang out there. One day, the owner, Margarita Roberts, was working in the office in the basement when she felt someone breathing on the back of her neck. There was no one there. She immediately ran upstairs. Some time later, a woman who did not know of her experience approached Margarita in the restaurant telling her that the man was sorry and didn’t mean to frighten her. He was only looking over her shoulder to see what she was doing. Margarita said she was totally surprised, because she hadn’t told that story to anyone but her husband, Ken. She also said one day she was joking with a customer about Lester when she felt a slap on her face. At that point, she made a deal with Lester that she wouldn’t joke about him if he never touched her again. Now they have almost become buddies. Margarita said that he travels with her in her car. He likes to flicker the lights inside. Ghost investigators have felt the presence of other spirits in the building. There is said to be a little black girl in the corner near the basement garage door. Sunshine tends to huddle in the corner trying to look small. She is very afraid and dates back to the Underground Railroad. Sunshine has a Virginia accent and appears to be waiting for her parents. It’s believed her mommy and daddy dropped her off their and never returned. She rocks back and forth while holding a rock in her hand, waiting to go home. Ken also told NewsNet5.com that there is a presence near the elevator in the basement. Many people have said that they felt as if they were being pulled into the elevator. The spirit has not yet been identified. That’s where you’ll find our live Web camera. Keep an eye on the camera and tell us if you see the spirit or maybe even Lester passing by. There are also reports of spiritual energy across from the elevator. This was the room where bodies were stored for the mortuary. Near the elevator shaft on the third floor is a narrow staircase. There appears to be repetitive loop or scene that has been impressed on this location. There was a fight at the top of the stairs between two men. A knife was involved and one man was killed. During the fight, a young girl fell down the stairs. A man tried to grab her ankle but was unable to stop the fall. A boy visiting the warehouse recently got upset when he was near the staircase. The presence of the girl falling really bothered him, Ken said. It is also believed that a worker who trying to help the girl jumped out of the window on the third floor. His spirit is still felt near the fifth window. In the northeast corner of the floor there supposedly is a woman looking out. It’s believed that she is waiting and looking out the window for someone to arrive. She tends to make people cry. Visitors who walk near the area are often overcome with emotion. The basement and third-floor areas are only accessible by invitation or during a Ghost Tour and Dinner. But the restaurant is open during the daytime. At the entrance to the area is an upright piano. It is said to have a ghost hanging around it. 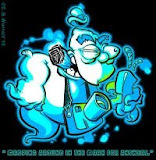 One paranormal investigator identified a ghost dog in the restaurant. She stood petting him and later saw him perched on one of the table chairs. Whether you see or feel a ghost at the Warehouse on the Canal or not, there are no explanations for the noises and effects the owners and visitors have identified in this historic building. Finally, the audio is being digitized for review from our April 26th Ghost Hunt of Zoar, Ohio. Yes, I realize that it's been several weeks since the event, but life gets in the way. As we are sitting here listening to the audio that we captured on our digital audio recorder, one thing is clear. We're rookies. Sure, we've watched Ghost Hunters on Wednesday nights and may think in the back of our mind that, "this stuff is easy!" But let me tell you, it's tough. Here's some examples of things not to do. 1. First, digital recorders are great at one thing. Picking up sounds. All kinds of sounds. Even when you think you are being quiet in one area that you are investigating, sounds from another room come through almost as good as if you were standing next to the recorder. Also, when speaking with others in your group, speak in a normal voice, don't whisper. Whispers can be mistaken for EVP's. That is of course if you are asking questions in hope of a response. And if you are doing the interview process, put the recorder on a surface away from you and don't touch it. The slightest sounds from shuffling it around get picked up VERY easily. 2. As for video, if you think you are picking something up on another device like an EMF meter or thermometer, point the video camera at it! Watch the "Yes" video to see what I mean. The EMF meter was going off and I had the camera pointed somewhere else. Duh! 3. Wear soft shoes, like sneakers. Going over our audio is driving us crazy with all the clomping around we're doing. 4. If someone makes a noise, like bumps against something, drops something, any loud noise, document it on audio. There are many sounds like this when we're asking for signs, and now we have no way of knowing if it was one of us. For instance, say into your recorder, "That was Dewey tripping over his own feet." Sounds simple, but helps immensely. 5. Watch your breathing. I hear myself breathing like a marathon runner. Honestly, it's VERY sensitive. 6. When capturing the audio to a computer, remember to adjust your levels! The first time through the computer, the mic input in windows was turned all the way up and the volume on the digital recorder was up all the way too. So when listening back to the recording, EVERYTHING was distorted to the point that it was barely understandable! As I monitor the recording levels on the capture now, it appears to be within appropriate levels and not spiking in the red. Okay, so that's it for now. Our advice is just practice. Go with the flow. Trial and error. That's why it's a hobby for us and not a Wednesday night hit television show for us. Not yet, at least. The PERVS are going on a Ghost Walk in Canal Fulton! This weekend we will be looking for ghosts and having a good time. Hopefully we can come across some ghosties, spirits, or strange things. Here is hoping we can get some evidence up soon from Zoar, Ohio and from the Ghost Walk if we find some there. PLEASE NOTE: October 19th, the 7pm tour is currently sold out. Space is available for the 10pm tour. LOCATION: The Lighthouse, corner of Hight St. & Second St.
A second source confirms the first EVP! Since I had a lot of free time today, I set out to try and examine the video that I had shot at Zoar on April 26. I came across the section of video tape that was shot as the same time as Eric was asking the question, "Are you a little boy" and we captured the EVP on Eric's recorder. The first grunt you hear is me at 2-3 seconds in. But pay close attention at 9 seconds in. I've amplified the sound to make it more clear. Again, this was taken with a video camera, but for some reason when I tried to post the video, the sound was lowered in the output and you really couldn't pick it up. Saving it out as a .wav fixed that! As this is my first time seriously hunting, I didn't have the camera pointed at Eric, but off to the side looking down along the wall. Rookie move, I know. This is in the first smaller basement of the Number 1 house as the larger basement was still closed off due to flooding. This is also a very small space so if there was anyone else physically around us at the time, we would have seen them. Judge for yourself. More to come as time permits! And as soon as I can get to Radio Shack to get another cable so that we can redo the EVP's to make them more clear, workable and easier to understand! I know, I'm running behind on getting my chores done. Just last night I started converted the video to digital format to start analyzing and I will place a report on here once that is complete. But I wanted to wet your appetite in the meantime. During the April 26th, and sadly the last, event at Zoar, Eric was asking specific questions with his digital recorder running. The following is just one of the EVP's we landed that night. I apologize, the quality isn't real great, but I think you can hear all that you need to. Eric asks, "Are you a child?" Please share you thoughts in the comment section for this post! If you've never watched this show on A&E, it follows the adventures of the Paranormal Research Society of Penn State University (or PRS). Founded by Penn State Alum Ryan Buell, himself having experienced paranormal phenomena as a young child, it's an interesting show. A bit melodramatic for my tastes, and I'm not totally in agreement of all it's "Oh, it must be a demon!" hypotheses, but definitely worth a view. Some really creepy things are captured, and the team does a great job of researching backgrounds. Anybody looking to start investigating the paranormal should take a peek at these guys. As Andrew is putting together the finishing touches on our EVP's, I thought I would post a pic of the "hot spot" of the night. This is the Number One House in Zoar where we got some good EVP's on the stairwell and the root cellar. Hello everyone who might have stumbled into our little group. My name is Jennifer aka The Medusa. (long story that involves card playing.) I have been interested in what might be on the other side for sometime now and being able to put stories to the test has been interesting. I am very much looking forward to hearing the posts of EVP's we captured in Zoar, Ohio. Most of all I am interested in hearing from you out there. What do you hear? Do you believe? Does the EVP's change your mind about life after earthly death? I am also looking forward to hearing about some of your stories out there. Have you had an experience? Where? Have you tried to rule out normal explanations for those experiences? So please share here and tell us what you think. Allow us to welcome you to the blog of The Ohio Paranormal Evaluation, Research and Validation Society. Otherwise know as The Ohio P.E.R.V.S. I know it sounds goofy, but we wanted something that would be easy to remember and somewhat fun. If you can't have fun with things why bother, right? The group consists of several old friends that have always had an interest in things out of the ordinary. We are all highly trained, educated and skilled individuals that aren't afraid to say that there are things out there in the world that we just don't understand. And while we look for that understanding, we also know that there are many things that something could be rather then what someone else may think it is. One persons orb is another persons dust ball. So join us on our journey here at this site. 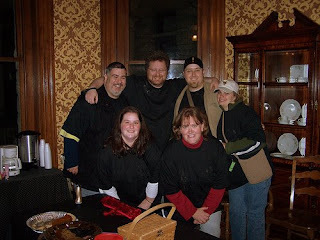 We recently were able to be a part of a ghost hunt in the historic village of Zoar, Ohio. We were able to get some EVP evidence and are still in the process of going though the video. Once the evidence is completely analyzed we will post our findings here. Join us on our journey, won't you?